True 3 bedroom Luxury Penthouse, Nicely Furnished, 2 Hot Tubs, Great Views! 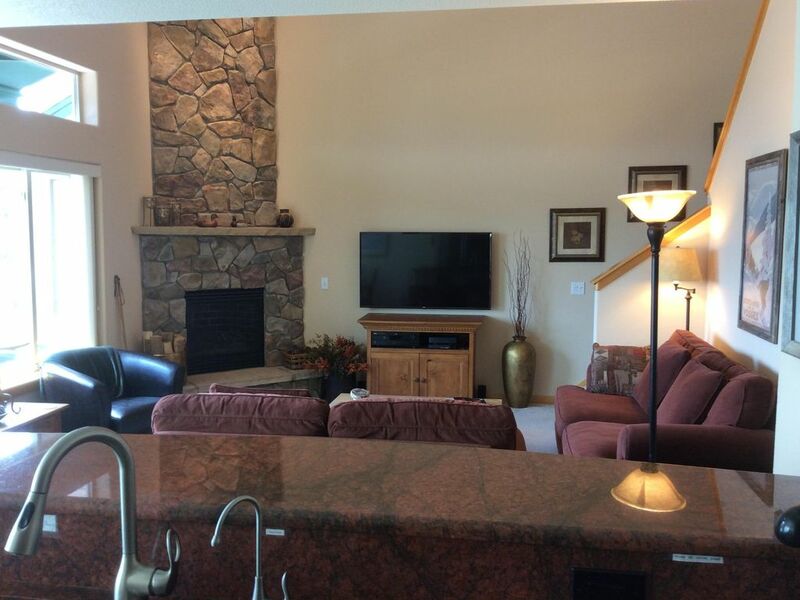 Imagine having your morning coffee while you look out through huge windows at an awesome panoramic view that takes in Copper Mountain, Breckenridge, Keystone, and all the beautiful Summit County mountain scenery in between from this fabulous luxury condo. It's a TRUE 3 BEDROOM, NOT a 2 bedroom plus non private loft which can be noisy and hot! You will be thinking what all my guests say...I'm glad I picked THIS place !! The interior of this unit is just as impressive as the view... decorated with cozy contemporary mountain furnishings featuring a vaulted ceiling with stone gas fireplace and 55"' 4K TV with Blu ray DVD/CD and surround sound in the living room, a huge private king bed master suite with separate bath and dressing areas, and an open living, dining, kitchen floor plan. A washer/dryer, gas grill on the sunny southfacing deck, and elevator access add to your enjoyment. After an adventure filled day, relax in both the INDOOR AND OUTDOOR HOT TUBS just steps from your door in the clubhouse. from shopping to skiing and fishing to fine dining; you will enjoy all of this from a setting nestled in the National Forest with hiking trails, meadows, beaver bonds and wildlife just outside your door. with convenient stops next door to Watch Hill and all towns and ski areas. I have been coming to Summit County since 1984 for winter and summer activities. I first purchased a 2 bedroom condo at Watch Hill in 1993, then traded up to my current 3 bedroom condo in 2001. I have owned and managed rental property since 1987 and became a licensed Colorado Realtor in 2005, so I am familiar with rental condos here in Summit County. I understand what you are looking for in a nice comfortable vacation rental, and know you will be as pleased with this condo as all my previous guests. I bought at Watch Hill for the open floor plan, great views, and central location close to Breckenridge, Keystone, Copper Mountain, Vail, and Loveland ski resorts. The view from the hot tub sealed the deal for me. This condo is furnished more like a luxury mountain home than a highly rented condo. You will appreciate the fine artwork, granite countertops, and comfortable beds and sleeper sofa, along with the top floor location which is nice and quiet. My neighbors on either side do not rent out their units, and most units in the complex are second homes...not rentals. Spotlessly clean, quiet, comfortable, and cozy....with breathtaking top floor mountain views! non assigned. maximum 2 vehicles under 20' must be registered to avoid being towed. No campers, trailers. 55" UHD Smart TV in Living Room. 32" TV in master. BEDDING is king in master, queen in second and third bedroom, plus comfy sofa sleeper. Watch Hill Complex features 2 clubhouses with both INDOOR and OUTDOOR HOT TUBS, This is a NON SMOKING unit and NO PETS allowed. HOA will have them removed by animal control. Apartment was perfect for our group (three couples) for a long weekend. Location is great and easy access to ski areas. Dan was extremely helpful in coordinating and a wonderful host. This high quality, spacious, comfortable condo was perfect for us. Extremely clean and well maintained. Dan obviously takes pride in his place, as he should. Additionally, Dan was extremely accessible. While we did not have any problems, we had questions. Dan was always there, answering emails, providing advice. We would definitely stay here again. We wanted to be in a central location to both Keystone and Breckenridge, and this was it. We didn't try the shuttle, but it looked convenient. I was worried about the enormous snowfall, but the roads were plowed and the drive was manageable. Thanks, Dan, for hosting our annual family ski vacation! Used this condo as a base for 6 family members on a winter vacation from February 15-17. Less than a 20 minute drive to Keystone, and several nice snowshoe trail options < 1 mile north of condo. Very clean condo, and all 3 bedrooms were spacious and comfortable. Great view out the back windows also. Would definitely consider staying here again. The condo is easy to get to from the Silverthorne Dillon exit. 20min to Keystone, 30min to Breckenridge and 45 to Vail. Great space for the family to spread out and it has a well appointed kitchen. A great place to come back to. Monthly/long term rentals considered. Check with owner for terms and availability. Reservations confirmed by owner with signed rental agreement and copy of signers drivers license.